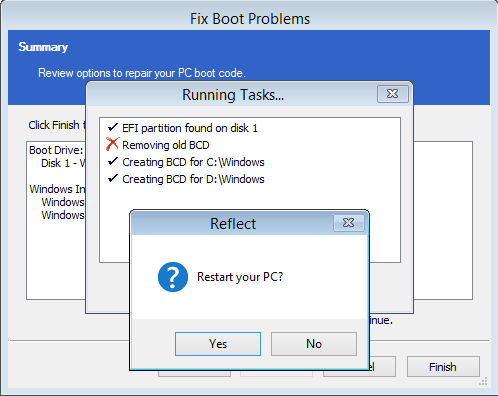 This article explains how to use the 'Fix Boot Problems' option to resolve common boot problems when restoring an image. When restoring an image or cloning a HD there can be situations where Windows is unable to boot due to incorrect boot configuration. This article explains how Reflect enables you to resolve these situations. 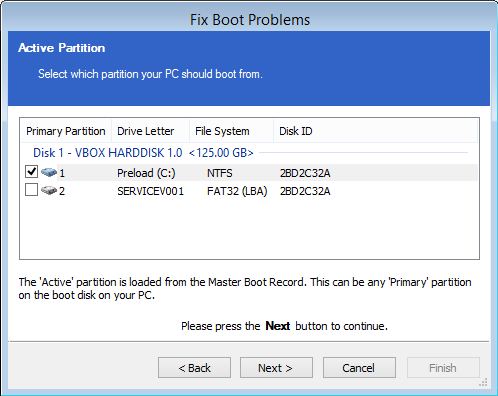 Depending on whether the disk you have restored uses GPT or MBR partitioning schemes, the action you need to take may vary. This article covers both cases. 1. 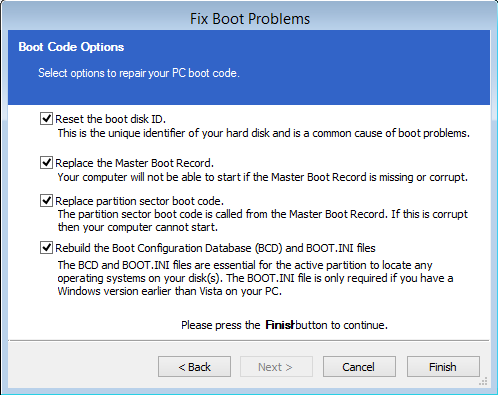 Select the restore menu, then select fix boot problems. 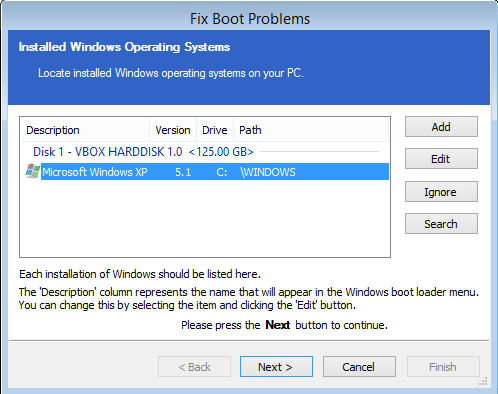 Alternatively, choose the restore tab then under restore tasks select Fix Windows Boot Problems. 2. 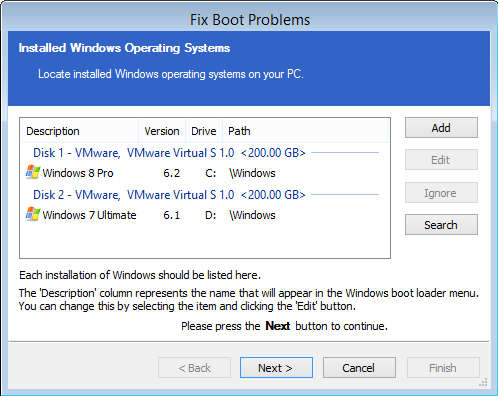 The Fix boot problems wizard will then open. 3. You will be presented with a list of Windows Installs, which the wizard detects. Verify these are correct. If the wizard has not automatically detected your Windows install, add it using the buttons on the right. You can also correct any details using the edit functionality. 5. 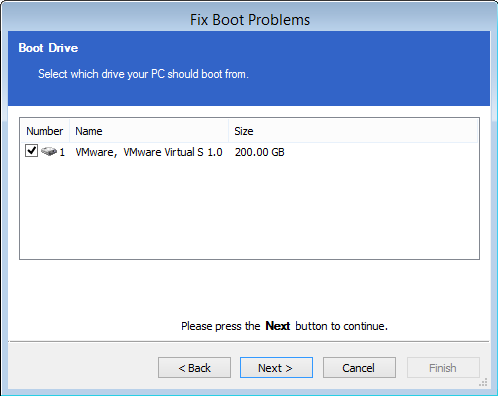 Choose the boot options to be fixed. We recommend leaving all options checked, however, power users may wish to alter the behaviour of the wizard. 6. Click finish. The wizard will then offer you the choice to reboot. If you need to perform additional tasks in the PE environment such as ReDeploy, select no. Otherwise, select yes. 7. Your system will now boot. 3. You will be presented with a list of Windows Installs, which the wizard detects. Verify these are correct. If the wizard has not automatically detected your Windows install, add it using the buttons on the left. You can also correct any details using the edit functionality. 4. (Optional Step) if you have multiple disks, you may be asked to select which you should boot from. Choose the disk you wish to boot from, then press next. 5. The wizard will then display a summary screen. Press Next. 6. You will then see a report showing you a choice of actions and allowing you to restart your PC. Select Yes if you wish to restart now and select No if you wish to perform additional tasks in the PE environment.